Less credible, but interesting for comparison purposes, is John McAdams’ compilation, which seeks to discredit certain witnesses. … things that contraindicated shots coming from one and only one location. According to Josiah Thompson’s tabulation in “Six Second in Dallas,” out of 190 witnesses on record about the direction of the shots, only 4 said they came from two directions. (p. 28, paperback). For any newbies out there, Thompson is a WC critic, not a supporter. Josiah Thompson’s tabulation is old news updated with the correct information Jean. At the link below you can find the correct tabulation complete with the witness testimonies stating they heard the shots coming from the knoll. You’re missing the point again, Willy. In the numbers you cite, out of 105 witnesses (52+48+5), only 5 thought they came from two different directions. One large group said knoll only, another large group said Depository only. IOW, they disagreed about where the shots — ALL the shots — came from. Why so many CTs think this means shots came from more than one location is a mystery. Only a tiny minority of witnesses said that. It is only a mystery to you Jean, because you miss the point, not of the numbers, but of the points of witnesses perceptions. Those at the perfect position to hear both directions equally well, AND who had very well tuned abilities at sound perception – (AND WHO WERE ASKED!) – would be the ones who could distinguish shots being fired from more than one direction. I want to add here, that there is certainly the great possibility of other weapons being used that were fitted with sound suppressors. There is also the possibility that all of the loud shots from unsuppressed weapons or cherry bombs. M80’s, etc. The ballistics prove the head shot came from the southwest corner of Dealey Plaza, just before the Triple Underpass. Whether that rifle was silencer equipped or not cannot be determined with certainty, but the position can. There is also the possibility that all of the loud shots from unsuppressed weapons or cherry bombs. M80’s, were diversionary – to draw attention away from the real sniper teams. Wrong! Position had nothing to do with it. One of the “multiple directions” witnesses was Millican, who was on Elm between the Newmans and the pergola, according to Thompson’s chart. Another was Holland, but he was down on the RR overpass. Some on the overpass said knoll, others said the TSBD area, but none said “both” except Holland. Throughout DP it wasn’t unusual for people standing right next to each other to pick opposite directions. “The ballistics” prove no such thing. But you wouldn’t be trying to change the subject, would you, Willy? Do you honestly believe this, Willy? The only people who you could credibly claim thought shots came from a single direction would be those in a straight line on either far side of the two shooters. There were quite a few witnesses place BETWEEN the TSBD and the knoll who nevertheless reported a single direction for the shots – more than “quite a few,” in reality. And, now a new excuse to explain away this basic evidentary problem – they weren’t asked! Seems like “where did the shots come from” is a confusing, rigged question. Right. No they don’t, Willy. If you want to line up your evidence on that count, I’ll be happy to eviscerate it for you, as I did with your Holland “4 shot” evidence. I did not say nor insinuate that the weapon fired on the Knoll might have been silenced. I posited that the gun used by the snipers who actually hit Kennedy may have been. Yes performing the impossible task of firing through a glass windowpane without shattering it. This “sniper” was described by the witness as “standing” and the height and weight was estimated as well as the color of shirt and trousers. How does this proposition stand up to critical certainty? Other witnesses saw what “might have been” the barrel of a rifle> other’s saw movement, “something” and other vague descriptions. This sort of declaration of victory by the one making the argument himself is tacky, smarmy, and arrogant in the extreme. Finally hot shot, what happened to your 95% argument you were so confident of? The ballistics do indeed prove this Jean. Please review and refresh your memory. “The ballistics do indeed prove this Jean. And the The Leaning Tower of Pisa? Are you asserting that this is a living artifact? That apples “leap” from trees? That a shovel cannot be leaned against a wall? It is a simple matter of physics Jean. Again as researchers Karger and Coupland noted the force in a moving bullet is energy of motion, or kinetic energy. Upon impact, the bullet pushes against the head, and initially, as the weight of the head is greater than the weight of the bullet, the head moves against the line of fire. Mr. STURDIVAN – “There is another section of film here, before we get to the skulls, which we forgot to mention. Perhaps we should go ahead and go through it since it is already there. This is a can of tomatoes which I think demonstrates some of the principles of physics that are involved here. The picture will be much the same as those with the skull. The bullet will be coming in from the left, will strike the can and you will see pieces of the can moving toward the right in the direction of the bullet, but you will also see pieces of the can moving in other directions. Hi Willy: This could account for the 95% single source/3 bullet points I made. However, there are numerous problems with this scenario if a silenced shot you refer to was the throat wound, from the underpass. First, and most basically, we are missing a bullet and exit wound from the throat – and nothing on the x-rays indicating what this bullet had to have hit. Also, the outward instead of inward thread patterns of the tie and shirt are inconsistent with this theory, as is the Ike Altgens photo which shows no windshield damage and Kennedy clutching his throat. But if you aren’t suggesting that scenario, then what are you suggesting? As with Helen Markham, the guns are drawn, so to speak, on William Brennan, this time to discredit the very existence of a TSBD sniper. But, as with Markham, there were multiple other witnesses. As with Brennan, Amos Euins actually witnessed a sniper and immediately reported it. Robert Jackson said he saw two black men looking above their window, looked above and saw a rifle barrel being withdrawn. Pressmen James Underwood, Thomas Dillard and Malcolm Couch all confirm Jackson exclaimed he saw a rifle, and Dillard took two photos showing the black men and the assassin perch above. Malcolm Couch also heard Jackson and saw a rifle being withdrawn. James Jarman, Bonnie Ray Williams and Harold Norman were the black men immediately below the 6th floor window. Norman said he said the shots sounded like they came from above them, he heard what sounded like shells hitting the floor above and the ejecting of a rifle. WIlliams said the shots sounded like they came from within the TSBD, and he said dirt or gravel from above fell in his hair. Williams said Norman said he could hear the shells being ejected from the rifle overhead. There is no serious doubt a sniper fired from the TSBD. And you didn’t do the same or worse when suggesting I take debate lessons after you incorrectly defined “argument from authority”? C’mon, Willy, just having some fun here! Hmmm… you’ve presented no argument against it – but I’ve shown it rules out a knoll assassin. A silenced weapon from elsewhere might account for a 4th shot, but as I’ve shown in the case of a throat/underpass shot, it doesn’t work as per the evidence. Hi Willy – your lightbulbs don’t make your case. The bullet strike one (#2) compared to the bullet inside (#3) seems to show #3 leaning into the direction the bullet came from, yes, but the bulb itself has moved several inches to the left, in reference to the mark on the table. (or have these photos been mixed and matched?) With Kennedy, we have the forward movement transfer associated with a bullet impact of ~200 grains at ~2,000 fps pretty well where we’d expect it – some one, one 1/2 inches going forward in Z312-3. The lurch backwards to the left is FAR too great to be associated with a transfer of momentum from a bullet strike of that approximate size. That’s rudimentary physics. There is some secondary effect going on there. Besides, the other evidence is not on your side. The Zapruder film clearly shows the right side of his head blowing out – towards the knoll. You’d not get such a complete blowout in the direction of entry. Maybe then from the front? But there is only a bullet entry wound in the rear of the skull, this is confirmed in the autopsy photos and x-rays. And in case there was any doubt that, say, an additional bullet hit but its entry was obscured by some of the blow-out, there are none of the attendant radial fractures from such an entry. We do see these radial fractures from the rear entry wound – they are quite clear on the x-rays, along with the perpendicular secondary fractures we’d expect. Further, the condition of the brain – the left hemisphere is nearly intact – is not consistent with an entry from the right side. It might work from the front, but you are left with the problem of a lack of radial fractures for that theory. The condition of the brain is consistent with a rear entry wound as well. If you want to try saying a frontal bullet entered an already shattered head, we are still missing that exit wound and the rear blow-out which is not visible in any photos or x-rays. The wounds are entirely consistent with a single bullet entering from the rear. Your only out here is to declare that the autopsy surgeons were liars, the x-rays were all faked, as were the photos. AND the teams of photo and x-ray experts were all lying when they said they could detect no sign of manipulation. You’d have to rely on the “expertise” of fellows like Robert “Bruno Magli” Groden and Jack “What is ‘photogrammetrically’?” White. Researchers Karger and Coupland noted the force in a moving bullet is energy of motion, or kinetic energy. Upon impact, the bullet pushes against the head, and initially, as the weight of the head is greater than the weight of the bullet, the head moves against the line of fire. As the projectile slows, more kinetic energy transfers to the target. A overcoming the weight of the head with a sufficient transfer of energy causes the target to move with the continued direction of force of the moving bullet. Application of contemporary wound ballistics research to the movement observed in the Zapruder film indicates a minute forward motion followed by more pronounced rearward movement—consistent with a single shot from the front. If you paid ANY attention to my commentary you would realize I do NOT support a shot from the Knoll as the head shot. When a projectile strikes the skull, radial fractures are created which extend outward from the wound. Internal pressure from temporary cavitation produces concentric fractures create that are perpendicular to the radial fractures. Research addressing the sequencing of radial and concentric of skull fractures in gunshot injuries indicates the radial fractures stem from the point of entry (Viel, 2009; Karger, 2008; Smith, 1987; Leestma, 2009). The Clark Panel observed extensive fracturing in the autopsy X-rays. The panel report specified there was extensive fragmentation “of the bony structures from the midline of the frontal bone anteriorly to the vicinity of the posterior margin of the parietal bone behind”. The report goes on the state, “throughout this region, many of the bony pieces have been displaced outward; several pieces are missing”. The Clark Panel report indicates the majority of the fracturing and displaced bones fragments are closer to the location they described as the exit wound; this is in direct conflict with scientific research concerning skull fractures resulting from gunshot injuries. The Kennedy autopsy report stated multiple fracture lines radiated from both the large defect and the smaller defect at the occiput, the longest measuring approximately 19 centimeters. This same fracturing pattern was discussed in the Assassinations Records Review Board deposition of Jerrol Francis Custer, the X-ray technician on call at Bethesda Hospital the night of the Kennedy autopsy. Custer testified the trauma to the head began at the front and moved towards the back of the head (CE 387 16H978; ARRB MD 59:10). Kennedy’s autopsy X-rays have distinct radial fractures propagating from the front of the head, with the preponderance of concentric fractures located at the front of the head. Current research indicates fracturing patterns of this nature correspond with an entry wound located in the front of Kennedy’s head. Some wounds present both internal and external beveling. Researchers attribute this pseudo-beveling in high velocity distance shots to the transference of kinetic energy to the skull as dislodged chips flaking off entry wound edges, producing the effect of beveling. Without careful examination, misinterpretation of an entrance wound as an exit wound is possible in all types of entries (Quatrehomme, 1998, Coe, 1981; Prahlow, 2010; Adams, 2010). “Besides, the other evidence is not on your side. The Zapruder film clearly shows the right side of his head blowing out – towards the knoll. You’d not get such a complete blowout in the direction of entry. Maybe then from the front?”? The Zapruder film most clearly shows the greatest amount of matter blowing upward, with several noticeable pieces flying into the grass to the left of the limousine. Which would be consistent with a shot hitting Kennedy in the right temporal area at a tangential angle and blasting through the right hemisphere of the brain. Willy has failed to address the obvious problem with his “lightbulb” claim – the bulb which he claims demonstrates the bulb leaning in the direction of the bullet is from a DIFFERENT sequence than the other three photos – look at the marks on the table – photos 2 and 3 are NOT of the same bullet strike, and the fracturing of the bulb in 2, 3 and 4 show different patterns, the table the bulb rests on shows the bulb in different positions, etc. 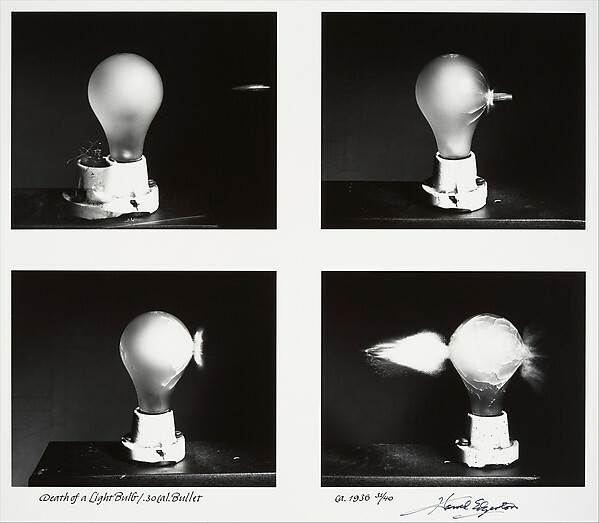 Clearly, someone has posted a sequence showing a bullet entering a lightbulb, but there are 3, perhaps 4, separate lightbulbs here being hit by a bullet! The photos, IOW, fail to make the nonsensical case that, magically, an entering bullet will somehow pull the object it is entering towards itself. You can’t seriously be claiming this, Willy? I have more than enough experience to not give a damn what Thompson, Galanor, McAdams, etc. conclude about the witnesses in their own minds. They are not my authority on making a decision. There is more than enough information in the witness testimonies to clearly comprehend that gunfire originated from more than one location. Relying on a majority number of witnesses hearing the same thing to make a conclusion is beyond sabotage of investigatory due diligence and an insult to any sapient individual’s cognition. Witness testimony is not a vote. It is to be investigated; an investigation of ALL witness testimony did not take place with professional due diligence that a rookie casualty insurance adjuster could have completed in less than 4 hours with a minimal amount of effort. It is amazing how well this article is hidden on the googly search engine! manipulated evidence to dismiss witness accounts of the assassination. “Over six hundred people witnessed the assassination of President Kennedy. The FBI acting on behalf of the Warren Commission interviewed at least two hundred of them. No Willy, it’s not amazing, its telling. it’s listening to the Mockingbird sing again. I know your aware but many are not. This is ridiculous. Curry is listed as a Knoll supporter, yet even the published statement supposedly supporting that view has Curry stating that he DID NOT know the source. Powers is listed as a Knoll witness, but the quote has him stating that the shots came from the right and overhead (TSBD was at that position). His “fleeting impression” that noise came from the front of the triple overpass is explained as his belief that they were in an ambush, not that he actually believed that was a source. O’Donnell is listed as a Knoll witness. His quote is that he believed from the right rear-and he always supported that view. O’Neill never supported his claim of what O’Donnell said and Powers never supported what O’Neill claimed in his book.Perhaps you should read John Farrell’s bio of O’Neill to evaluate O’Neill’s veracity . Bill Decker is listed as a Knoll witness. Yet there is no quote posted as to where he thought the shots came from. That is just FOUR false claims for Knoll witnesses, including two who stated under oath that the shots DID NOT come from the Knoll. Accept no substitutes? After four demonstrably false claims? If your position is correct you do not need to lie. These examples are willfull attempts to deceive the gullible. Galanor does his best to put as many witnesses as he can in the Grassy Knoll category. Here is a less biased tabulation. Here is a question for all of the experts here. How many decibels would the muzzle blast of a 6.5mm Carcano M91/38 short rifle produce? How many decibels would that sound register as with the bystanders on Elm St. visible in the Altgens 6 photo? How many decibels is considered to be the “threshold of pain”? At how many decibels do humans produce involuntary and instantaneous startle reactions? Enough to cause Secret Service Agent’s on the right running board of the follow up car to look back and up. But just as a distraction while JFK was shot from elsewhere. As far as the shot’s from elsewhere part it’s been well documented between this site, the Education Forum and CTKA. …it’s been well speculated between this site, the Education Forum and CTKA. By well documented are you suggesting actual physical evidence or witness statements? Powers and O’Donnell to Speaker of the House Tip O’Neil. Not speculation, what they saw. Tables 1 and 2 for firearm peak pressure levels (PPL). In a report to the HSCA, it was claimed C2766 registered 157 decibels at one meter from the rifle, and 137 decibels at 30 feet from the rifle. Here is the $64,000 question, the answer to which was never provided to the HSCA: One meter and thirty feet from the rifle but, which direction from the rifle? Do any of you know why it would make a difference where the tester was standing in relation to C2766? Yes, it makes all the difference in the world, Ronnie. Noises above 120 decibels, considered the threshold of pain, produce involuntary and instantaneous startle reactions. Do the bystanders in the Altgens 6 photo appear to have experienced two very loud muzzle blasts from a rifle 3.5 and 5.2 seconds before this photo was taken, if you consider the muzzle of this rifle was a mere 62 feet above their heads, they would be standing ahead of the muzzle of the rifle and the muzzle blasts they heard would likely have been in excess of 130 decibels? Or are the bystanders smiling and clapping and carrying on as if nothing has happened? We requested three motorcycles to be running during the test to provide some background noise that would approximate the original listening conditions in Dealey Plaza Unfortunately, these newer motorcycles were not very noisy, but the shots were so loud that any reasonable level of background noise would have been low in comparison with the shots themselves . Our listening conditions were, therefore, essentially representative of those at the time of the assassination, except for our being able to hear some very-low-level, long-delay echoes that originally might have been inaudible. Only within a few feet of the source of the sound Bob. The loudness of sound decreases exponentially with distance. There is no noise decrease (sound reduction) or sound drop per meter. The tests showed C2766 to have a sound level of 137 decibels 39 feet out from the rifle. the bystanders were only 62 feet below the 6th floor window, meaning that, at most, the sound reduction to them would have been another 7 decibels. In other words, the bystanders on the sidewalk would still have heard a blast measuring 130 decibels; twice as loud as the threshold of pain at 120 decibels. Do the bystanders in the Altgens 6 photo look they have just heard two very loud and very painful shots in the last 5 seconds? Persons experiencing sudden and unexpected sounds above 120 decibels experience unexpected and instantaneous startle reactions regardless of the distance to the source of the sound. Sorry, I’ve made a mistake here. The decibel scale goes up by a factor of 10 for each 10 decibels, similar to the way earthquakes are measured. In other words, a sound of 130 decibels is 10 times as loud as a sound of 120 decibels, and a sound of 140 decibels is 100 times as loud as a sound of 120 decibels. A sound of 150 decibels is 1000 times as loud as a sound of 120 decibels and, finally, a sound of 160 decibels is 10,000 times as loud as a sound of 120 decibels. As I stated before, 120 decibels is VERY loud, and considered the “threshold of pain”. If 160 decibels is 10,000 times as loud as 120 decibels, and Oswald’s alleged rifle tested at 157 decibels at one meter from the rifle, and at 137 decibels 30 feet from the rifle, how loud was the sound heard by Bonnie Ray Williams, Harold Norman and Junior Jarman directly below the 6th floor window, and a mere ten feet from the muzzle of the rifle? So, once again, can anyone guess how a shot from behind the limo could have been made to appear to have been coming from the Grassy Knoll? The second (smiling and clapping) is true of the bystanders around the TSBD. As far as the bystanders near the knoll, there were many frantic and hysterical reactions; hitting the dirt, ducking, parents covering children with there bodies. Also running up to the fence after the limo had passed under the triple overpass. Do you know why there was a difference in the reaction of the bystanders near the entrance to the TSBD and the bystanders near the Grassy Knoll? The answer is connected to my first question, which is, how can a shot originating from behind the limo be made to appear to ear witnesses as if it were originating from the Grassy Knoll? The experienced gun shot wound doctor who examined the wound said no doubt the bullet entered from the front killed the president. Come on America case closed at least 2 shooters. The insouciance of certain commenters with regards to the totality of ALL the witness testimonies is leading to the painfully repeated fallacious argument that the gunfire could have only come from one direction because, to those insouciant individuals, only one direction of shooting could have occurred, with no explanation as to why that is. With no other explanation, this is unwarranted inductive reasoning based on the Warren Commissions conclusions, which still have yet to be substantiated. Just as the witnesses who heard shots coming from behind them and above towards the buildings in Dealey Plaza, the witnesses testimony that is inconvenient to shots coming from only one direction also count. Witnesses’ perceptions of sound are evidence, not votes for which set of similar psychoacoustic testimony counts more. The Warren Omission and its illegitimate acolytes within the MIMAC (Military Industrial Media Academic Complex) would seek to turn tabulation of the ear witness testimonies into a democratic referendum where each testimony is turned into nothing more than being a vote for what final conclusion would arise for where shots originated, allowing one set of testimony to overrule the other set simply based on numbers, so long as there was only one point of origin for the gunfire. That isn’t how investigations for the truth are done. The truth isn’t always singular in definition and it doesn’t always originate from one set of similar witness testimonies. There are contraindicative psychoacoustic circumstances that immediately impeach the inadequate final conclusion of the Warren Omission and the fallacies being employed to defend it. Gunfire appears to have originated from more than one direction, and even the vague “from behind” testimonies do not automatically mean that the witnesses heard gunfire specifically discharge from the TSBD’s sixth floor window; witnesses did not specify the TSBD because they didn’t know from what buildings or locations from behind them the shots originated. They just perceived that the shots were fired from behind, and for some, above. ALL the buildings should have been investigated and all the people in the area should have been searched, if possible. It seems to me that whoever was involved in carrying out this style of murder had done it before with the coordination (some may say incompetence) of those responsible for preventing and investigating it.